Advertise on this Site for less than $1 per month!!! Please contact me @ ak_g@ymail.com !! Search this site for content you need(;>)!! 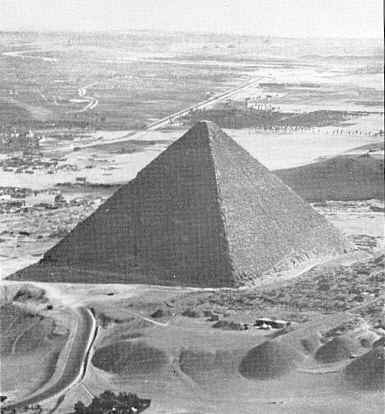 Most of the photos in this tour were taken from the out of print 4 volume set "Pyramidology" by Adam Rutherford (released between 1957- 1972). Adam Rutherford was one of the greatest Pyramidologists that ever lived. These pages may take some time to load but I think it is worth the wait. There are 40 photos on 6 pages. Before we enter the interior of the Great Pyramid, let us look at some EXTERIOR views. The Great Pyramid of Giza stands on the northern edge of the Giza Plateau, located about 10 miles west of Cairo. The Greeks listed the Great Pyramid of Giza as the first wonder of the world and it is the only one of the seven still remaining to this day. 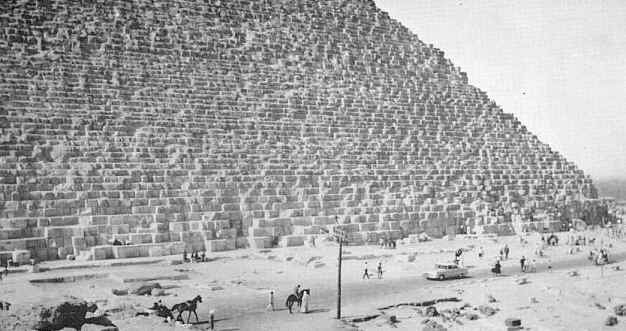 The Great Pyramid is composed of over 2 ½ million blocks of limestone which weigh from 2 to 70 tons each. Its base covers over 13 acres and its volume is around 90,000,000 cubic feet. Next to the Great Pyramid stands 2 additional large pyramids. The Great Pyramid is thought, by traditional scholars, to have been erected around 2600 BC during the reign of Khufu (whom the Greeks called Cheops) of the 4th Egyptian Dynasty. The slightly smaller one is attributed to Cheop's son and successor, Kephren. The other, still smaller, is attributed to Kephren’s successor, the grandson of Cheops, Mykerionos. 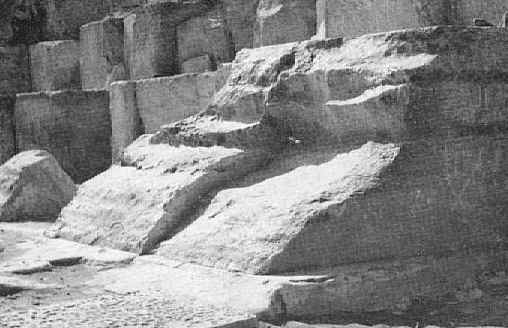 Recent geological studies indicate that the Great Pyramid and the Sphinx may be at least 10,000 years older than traditional scholars have thought. (4) North-East Corner. Adam Rutherford is seated on a camel. 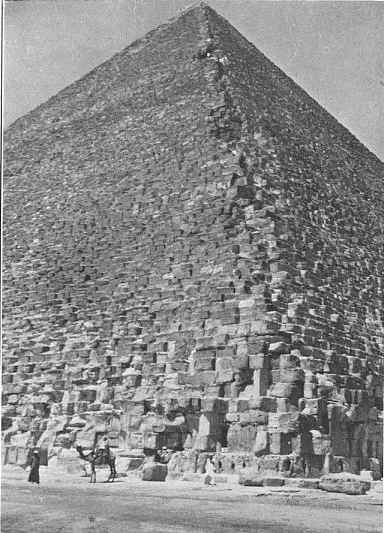 James Ferguson, in his great work, the History of Architecture, describes the Great Pyramid as "the most perfect and gigantic specimen of masonry that the world has yet seen. 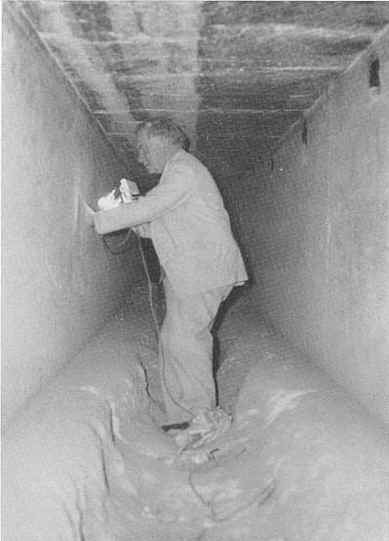 No one can possibly examine the interior of the Great Pyramid without being struck with astonishment at the wonderful mechanical skill displayed in its construction." (5) Looking down from the top of the S.W. Corner. It is 454 feet high which is equivalent to a modern 48-story building. There are 203 courses or steps to its summit. Professor Greaves, astronomer, in his book, Pyramidographia says "The structure of it hath been the labour of an exquisite hand." 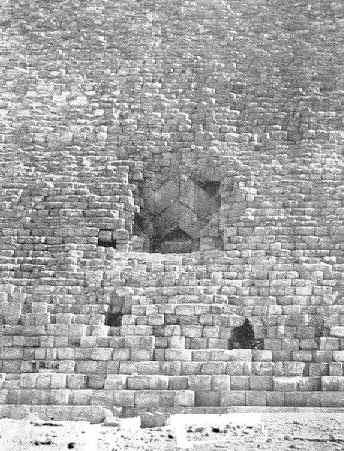 (6) Central part of the Summit (Top) of the Great Pyramid. 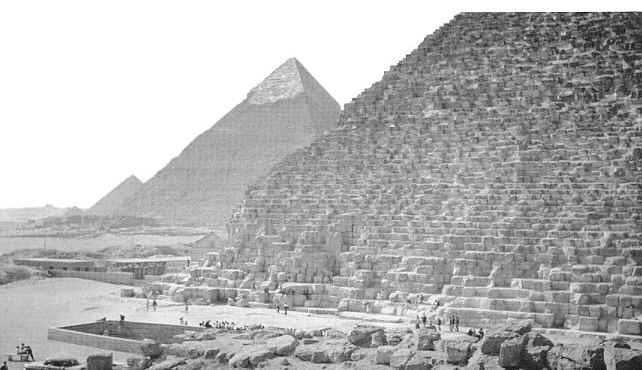 It appears that the Great Pyramid was never finished since the top is flat, and not pointed, as it should be. It has a truncated summit which is coarse and uneven and measures about 30 square feet. 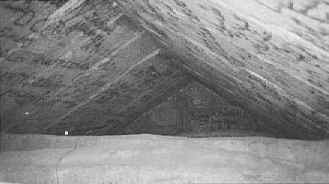 Most pyramids were crowned with a top-stone that completed their structure. This pyramid does not currently have one and it appears that it never did. 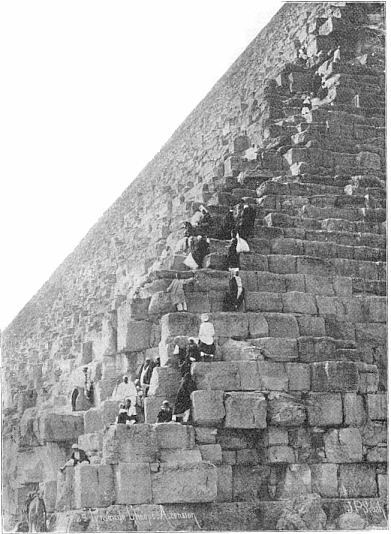 (7) Tourists and guides climbing the Great Pyramid in the early part of the 20th century. H.E. 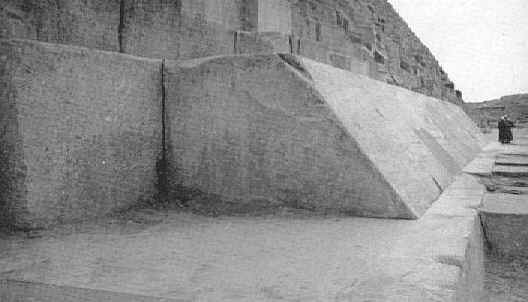 Licks, mathematician states: "So mighty is the Great Pyramid at Gizeh and so solidly is it constructed that it will undoubtedly remain standing long after all other buildings now on Earth have disappeared." 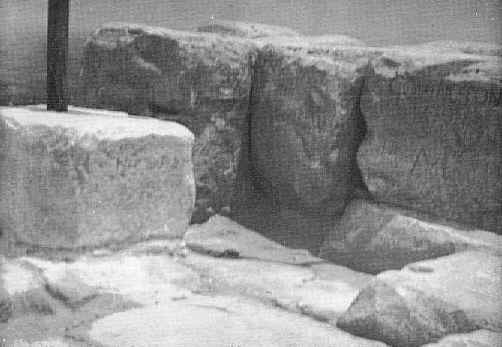 The beautiful smooth blocks which covered the entire exterior, thus encasing the whole structure, became known as Casing Stones. At the present, only a few of these are left in position on each side at the base, most of the others having been stripped off by the Arabs and cut up to build mosques in Cairo. 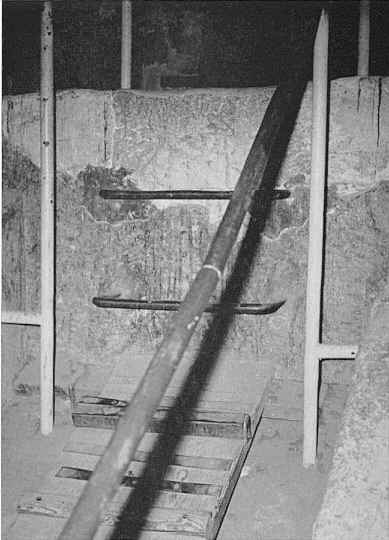 One of the largest remaining Casing stones is nearly 5 feet high by 8 feet at the bottom, and weighs about 14 tons. Before the Arabs began to tear off the very beautiful casing stones about 600 years ago, it was magnificent to behold. The ancient writer, Strabo, said of the Great Pyramid, "It seemed like a building let down from heaven, untouched by human hands." 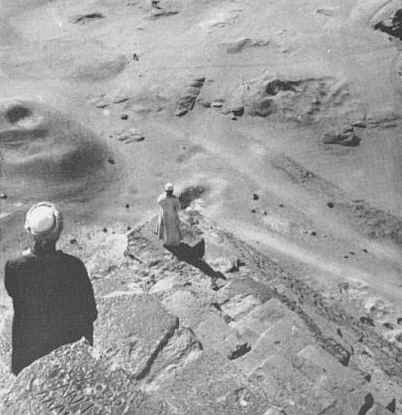 It has been calculated that the original pyramid with its casing stones would act like gigantic mirrors and reflect light so powerful that it would be visible from the moon as a shining star on earth. As far as we know, the first people to enter the great pyramid since the time of its contruction were the Arabs in 820 AD. 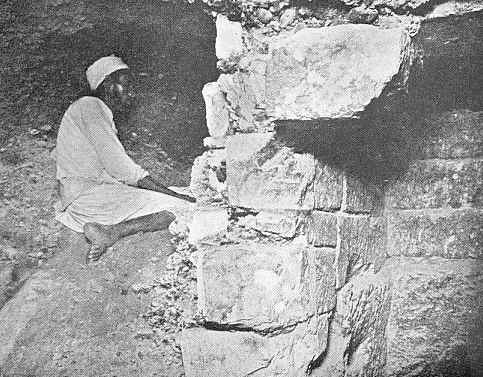 Under caliph, Al Mamoun, the Arabs broke into the great pyramid (since they could not find the hidden entrance) by boring into the limestone with crude instruments. After months they did manage to break in and find the descending passage. 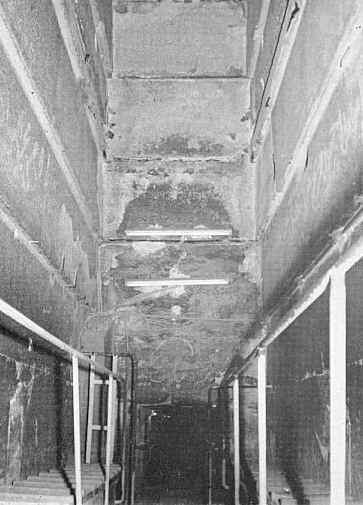 In the ceiling 97 feet down the descending passage is a granite plug which blocks the entrance to the ascending passage. It is made of very hard quartz, mica and feldspar. There are 3 granite plugs side by side. 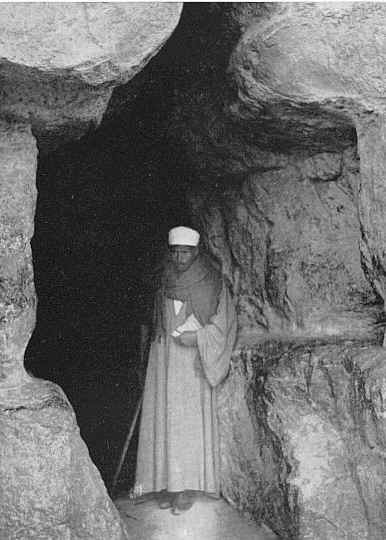 Al Mamoun's men dug around these plugs through the softer limestone to gain entrance into the ascending passage. Once around these granite plugs we are in the ascending passage. The ascending passage slopes up at a 26-degree angle (same angle as the descending passage slopes down) and has the same dimensions as the descending passage (3 1/2 feet high by almost 4 feet wide). Following the ascending passage for 124 feet, we finally arrive at a large open space known as the Grand Gallery. At this point of intersection, you can take one of two routes. You can continue going up the grand gallery and eventually end up in the King’s chamber or continue in a horizontal direction through another passage (127 feet long) and wind up in the Queen’s chamber. The ascending passage opens up into a large open space known as the Grand Gallery. 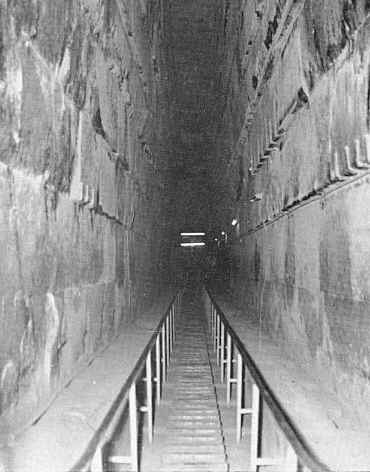 It is a hall 153 feet long and 7 feet wide at the floor level and about 28 feet high It continues upward at the same slope as the ascending passage. The walls rise in seven courses of polished limestone each corbeled 3 inches toward the center, making the gallery narrow from 62 inches at the base to 41 inches at the top. The first corbeling is 7 feet high. On both sides of the central 2 foot passage are two narrow ramps 18 inches wide and slotted at regular intervals. The purpose of these ramps is unknown. At the top of the Grand Gallery lies a huge stone step which measures 6 feet wide by 3 feet high. It forms a platform 8 feet deep. It is very worn and chipped. Past the Great Step is another low, horizontal passage 41 inches square which leads to the King's Chamber. A third of a way along this passage, it rises and widens into a sort of antechamber, the south, east and west walls of which are no longer limestone but red granite. 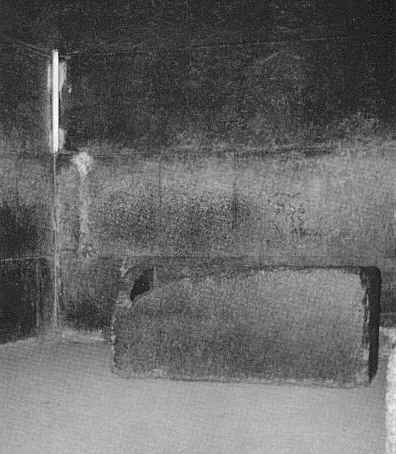 The King’s Chamber, made out of granite, measures about 34 feet by 17 feet and is about 19 feet high. It should be noted that all the passages in the Great Pyramid are all in the same vertical plane, parallel to the north-south axis of the pyramid. They are not in the direct center of the pyramid but off 24 feet to the east of center. 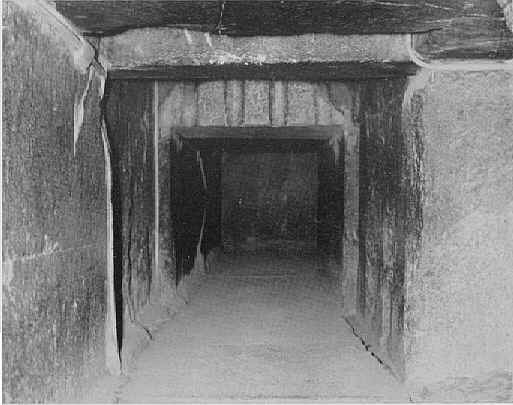 Thus the entrance to the pyramid is not in the centerline of the north side, but to the east of it by 24 feet. Also all the chambers extend westward from the vertical plane of the passage system, and none extend eastward. 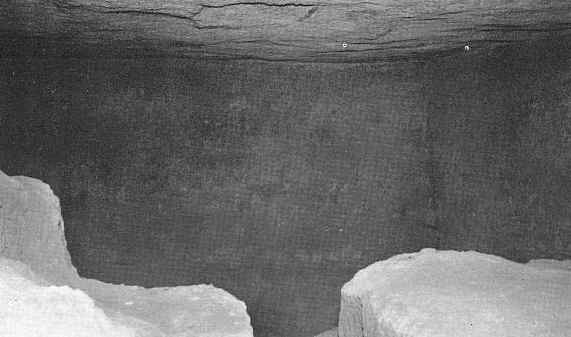 The only item ever found in pyramid is the coffer in the King's Chamber. It is a lidless box cut from a solid block of granite. It's dimensions are 6 feet 6 inches long, 2 feet 3 inches wide, and 3 feet deep. It may have once had a sliding lid since there is a ridge along the top edge of the coffer. It is chipped at one corner. 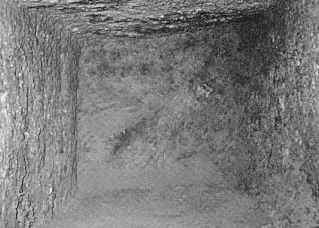 Above the roof of the King's Chamber are found a series of 5 cavities or chambers. 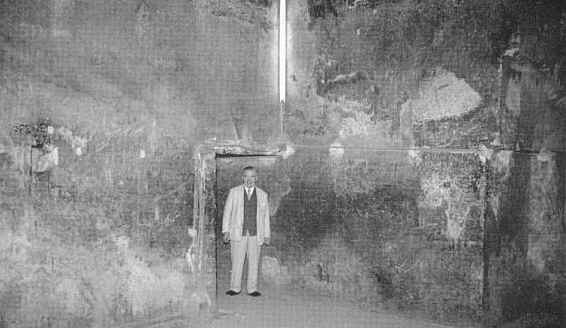 These have been labeled "relieving chambers" by Egyptologists since they think that the purpose of these spaces is to prevent the collapse of the King's Chamber from the tremendous weight of the masonry above the chamber area which amounts to several million tons. This reason has been recently questioned and the purpose of these chambers is still being debated. As mentioned before, if you continue at the junction of the ascending passage and Grand Gallery through the horizontal passage which runs for 127 feet you wind up in the Queen’s Chamber. This passage is 3 feet 9 inches high and 3 feet 5 inches wide. 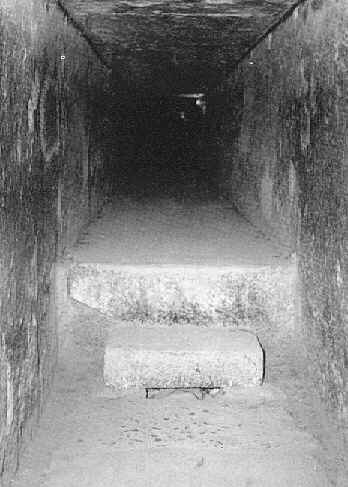 A sudden drop of 2 feet occurs towards the end of the passage before the entrance to the Queen's Chamber. 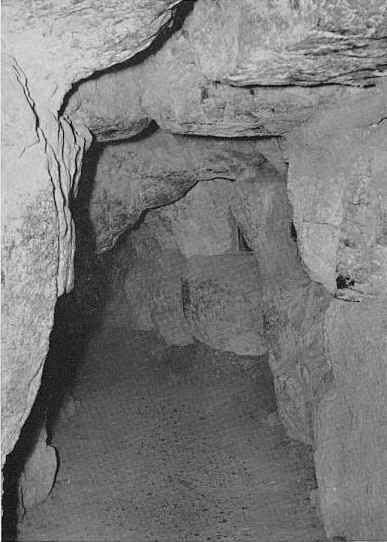 The Queen's Chamber has a rough floor and a gabled limestone roof. The name Queen's Chamber is a misnomer. 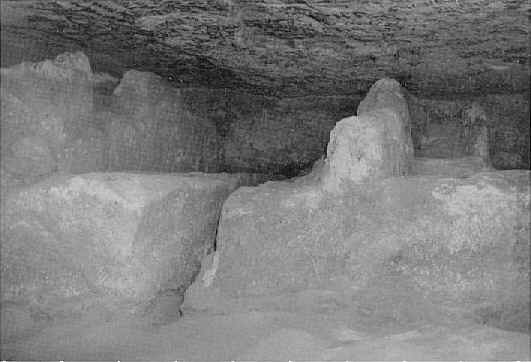 The custom among Arab's was to place their women in tombs with gabled ceilings (as opposed to flat ones for men), so this room came to be labeled by the Arab's as the Queen's Chamber. 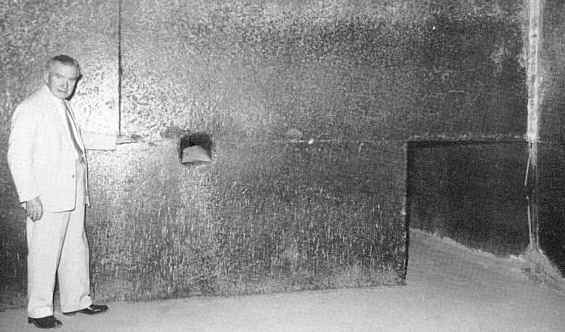 The walls of this chamber are mysteriously encrusted with salt as much as much as 1/2 inch thick. The chamber dimensions are 18 feet 10 inches by 17 feet 2 inches. It has a double pitched ceiling 20 1/2 feet at its highest point, formed by huge blocks of limestone at a slope of about 30 degrees. The Niche was originally 3 feet 5 inches deep but a passage has been hacked through the back for several yards. The Niche is just over 16 feet high. 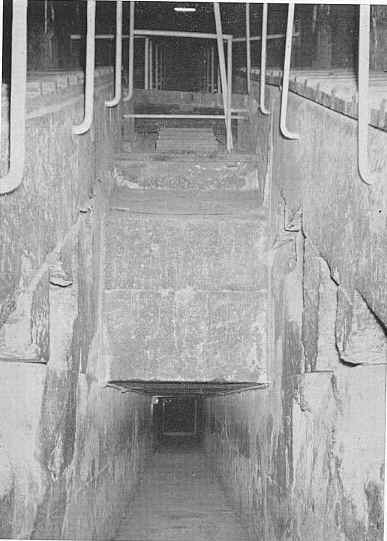 The airshafts from the King's Chamber were found to exit to the outside of the pyramid. 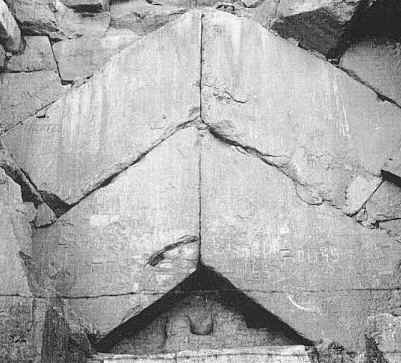 It appears that the Queen's Chamber airshafts do not lead to the outside but may terminate at an entrance to a secret chamber within the pyramid. 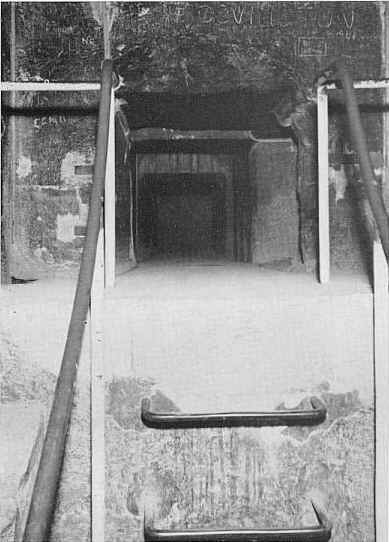 31- The Unknown Door at the end of the southern air shaft. 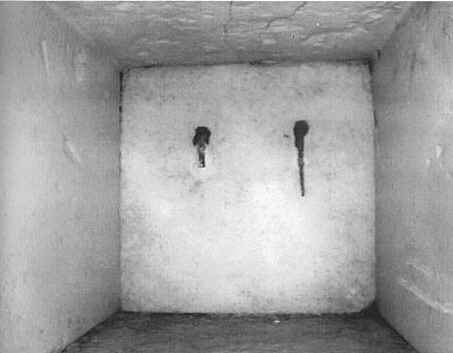 Rudolf Gantenbring in 1993 sent a small robot with a camera up the southern air shaft in the Queen's Chamber. 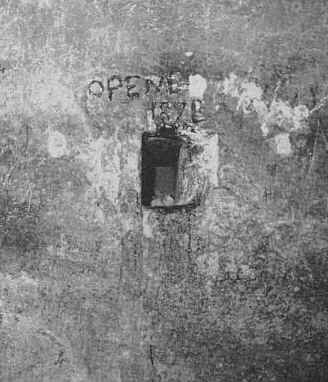 After traveling about 200 feet up the air shaft it came to a small door complete with copper handles. The air shafts are about 9 inches square. As far as we know, this door has not been opened and what is inside remains unknown. 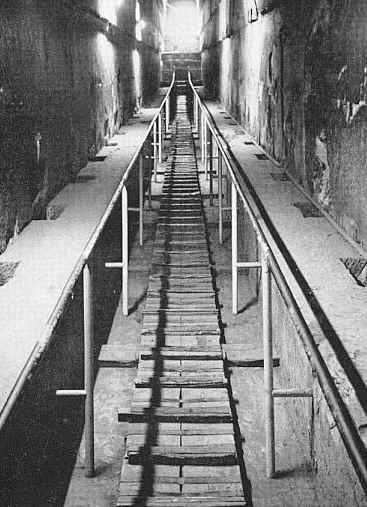 The distance of the descending passage to the beginning of the horizontal Subterranean chamber passage is about 344 feet. This shorter horizontal section leads to a small lesser subterranean chamber and then continues into the large subterranean chamber. This large chamber is a strange place, measuring 46 X 27 feet with a height of about 11 feet. It is cut deep into the bedrock almost 600 feet directly below the apex of the Pyramid. Its ceiling is smooth and and the floor is cut in several rough levels, making it look unfinished. It has also been referred to as the "upside down room". In the center of this chamber on the east side is a square pit which is known as the "bottomless pit". 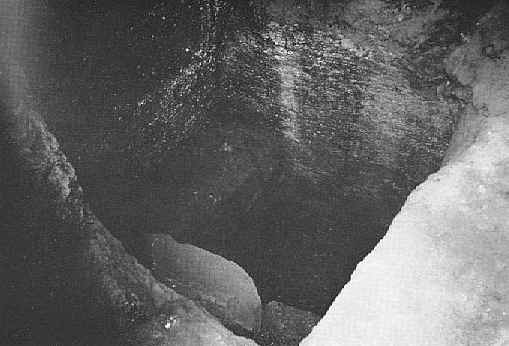 It is called the "bottomless pit" since at the time of its discovery, it was not known how deep it was. 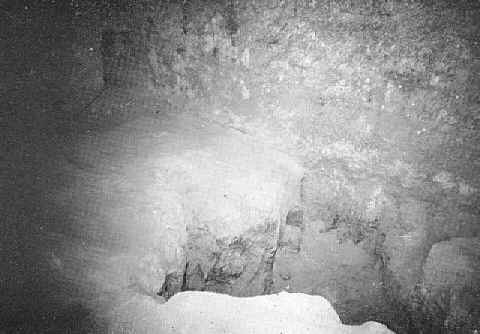 The Pit was 12 feet deep in 1838 , but was dug deeper by the explorer Colonel Vyse in the hope of finding an outlet that would lead to a hidden chamber. 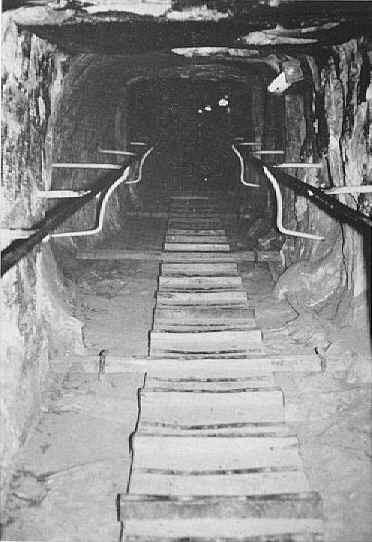 The Edgar brothers account of their visit to the pyramid in 1909 state that "In the unfinished floor of the subterranean chamber appears the large, squarish mouth of a deep vertical shaft. 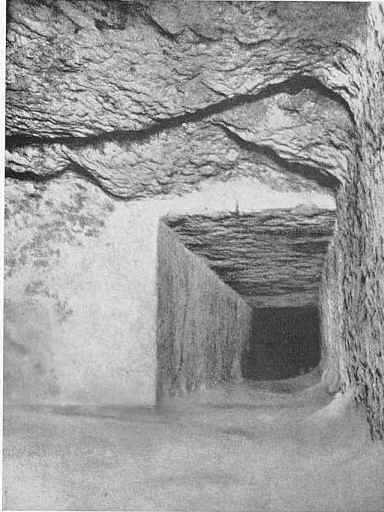 We had always to avoid walking too near its edge, for the rough uneven floor of the chamber is covered with loose crumbling debris". In the south wall, opposite the entrance, is a low passage (about 2 1/2 feet square) which runs 53 feet before coming to a blind end. 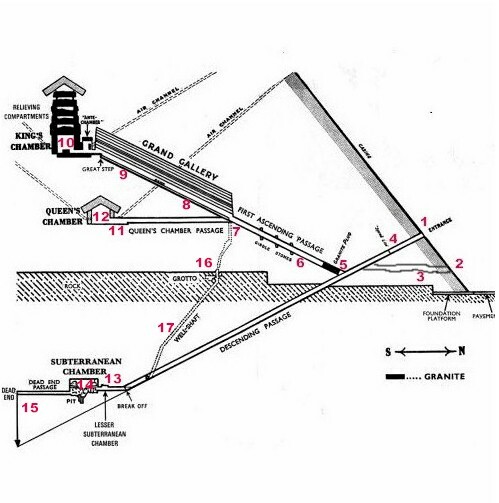 At the intersection where the ascending passage meets with the Grand Gallery is a hole which leads to a shaft (known as the well shaft) which connects with the descending passage below. This near vertical tunnel is about 3 feet in diameter. As it continues downward a grotto opens off the shaft. 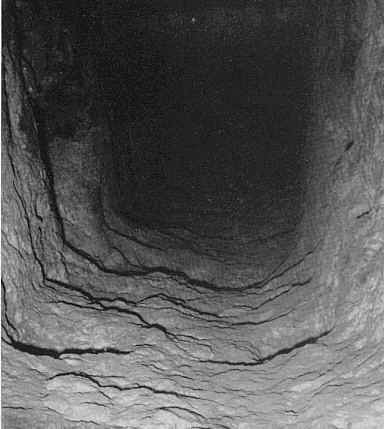 The shaft than continues downward to connect with the lower part of the descending passage. The purpose of this well shaft remains a mystery. 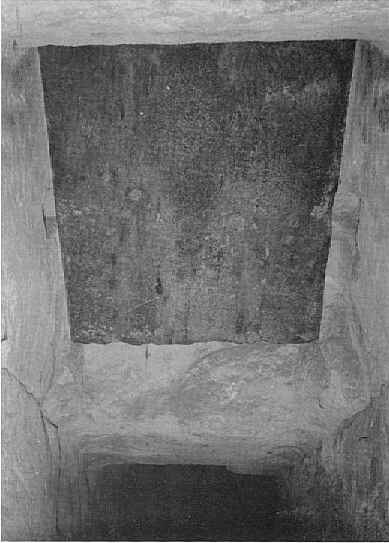 To end this tour, let us go back and look more closely at the most mysterious part of the Great Pyramid, the empty coffer in the King's Chamber. 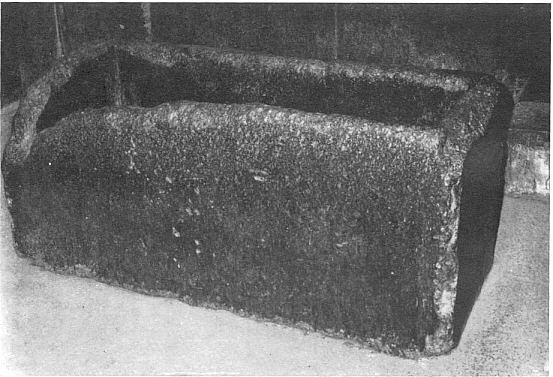 This beautiful granite shaped box made was made from a solid block of chocolate-colored granite and is even harder than the granite walls of the King's Chamber. For thousands of years, many have wondered about its purpose. Ancient legend says that it came from Atlantis or even from America. It was never inscribed or decorated. 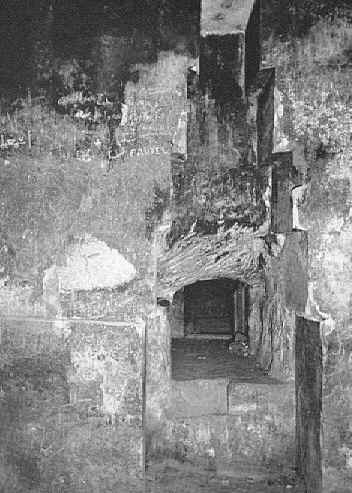 Also, since it is too large to pass through the low passages leading into the King Chambers, it must have been placed in the chamber before the chamber was closed and passages sealed. The volume of the Coffer is equal to that of the Ark of the Covenant. It is 89.8 inches long, 38.7 inches wide and 41.2 inches high. The sides are close to 6 inches thick and the bottom 7 inches thick. Get the Random Did You Know Facts widget and many other great free widgets at Widgetbox! #Don't compare yourself with any one in this world;If you compare, you are insulting yourself! #No one will manufacture a lock without a key;Similarly God won't give problems without solutions! #When life gives you 1000 reasons to cry,show the world that you can still find a million reasons to smile! #Easy is to judge the mistakes of others;Difficult is to recognize our own mistakes! #Don't care about what others think of what u do;but care very much about what u think of what u do! #No one can go back and change a bad beginning;But anyone can start now and create a successful ending! #If a problem can be solved, no need to worry about it;If a problem cannot be solved what is the use of worrying?! #If you miss an opportunity don't fill the eyes with tears;It will hide another better opportunity in front of you! #Be bold when you loose & be calm when you win! How would you Rank this Site?! © 2008-2020--G.Arun Kumar.All Rights Reserved.